Conservation of birds in the wild is dear to the hearts of most of us who enjoy working with and living with birds. Sometimes we have the opportunity to actually participate in conservation work, either through funding or through working on site in other countries. Following is the story of a conservation project. 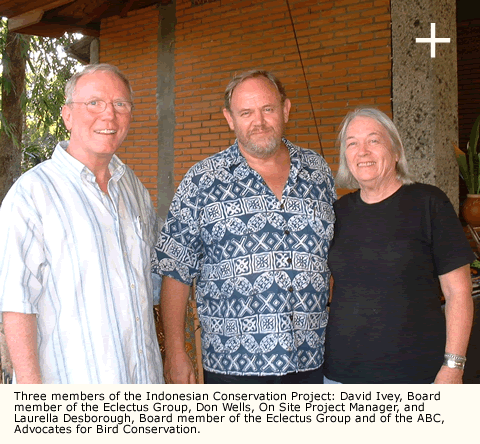 A few years ago, Don Wells, well known US aviculturist in the US, moved to Bali, where he manages a large bird farm. 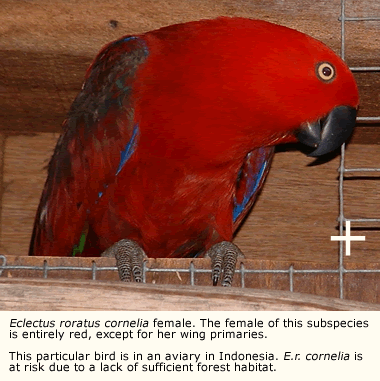 While living and traveling in Indonesia, he became aware of the critical situation for eclectus parrots and Citron crested cockatoos on the Indonesian Island of Sumba. With extreme habitat loss, adult pairs of cockatoos and eclectus parrots are actively fighting for the few available nest sites. Seeing this situation and aware of the use of man made nests in other countries, Don believed that man made nest logs could make a big difference for the survival of both parrot species. Members of the board of directors of the Eclectus Group shared that opinion and decided to take action to make a difference for these desperate parrots. So, David Ivey and I, (both of us are board members of the Eclectus Group), traveled to Indonesia to meet with Don Wells, and then to Sumba to meet with Director Zulkifli, head of the Indonesian Forestry Department of West Sumba. We spent about two and a half days in Sumba with the director, traveling across Sumba, noting the nature of the land and its people, the forests, hills, rice fields and farms. We discussed the problems faced by all the endemic wildlife due to habitat loss and the fires that threaten the few remaining forests. The rare Sumba hornbill and other birds are also threatened. The first morning we traveled to the forest refuge. Director Zulkifli and two staffers and a driver took us far out into the countryside, past small villages, off paved roadways, past small farms, onto bumpy roads of hard red clay and white limestone rocks. Finally we arrived at a place where the vehicle could not travel further, due to being tightly stopped between heavy bushes and upended rocky outgrowths. So, we all stepped out and climbed up the nearest clay bank. Meeting us was one of the local villagers who was knowledgeable about the forest and the birds. We started off, single file, across rough fields of dry grasses as this is the dry season on Sumba. We passed a farmer turning sod for a garden or small corn crop, working on a slightly sloping hillside. His tools were two sturdy bamboo poles with which he dug into the earth and pushing the poles back and forth until he could turn the huge lump of sod. We walked through dry rice fields, separated by foot high ridges of rock and clay which holds water after rice is planted. Finally we arrived at the edge of the forest, hot and sweaty due to the humidity and heat. We stopped near a deep stream bed where fast moving water had carved out the soft limestone and left huge curving walls of stone. The stream bed was completely dry and we could only imagine the deep and swift river that would be pushing its way past these rocky walls in the near future. Next to the stream was a huge tree with widely spreading limbs and many dark clumps on its trunk. Sometimes we have the opportunity to actually participate in We saw these clumps were large figs which were growing on the trunk and on the larger portion of the limbs, but not on the ends of branches. 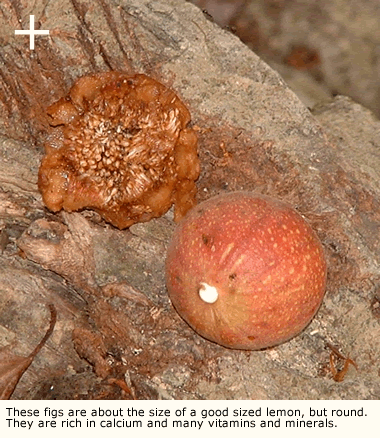 These are the kinds of figs that parrots eat and likely are a major portion of their diet during the dry season when other fruits are not plentiful. After resting a bit, we trekked on, entering deeply into the forest where the thick under growth and tall trees darkened our brush lined pathway. Brown leaves lined the narrow path, covering the red clay clods and white limestone rocks of many different sizes. When the path became steep, we had to use hand holds on exposed tree roots or rock outcroppings. When the path led downhill, we had to either go down very very carefully, or if the way was more open, we could run down in order not to lose our footing and slip. We saw no animals, no insects, no reptiles, no life, until we heard a bird calling. 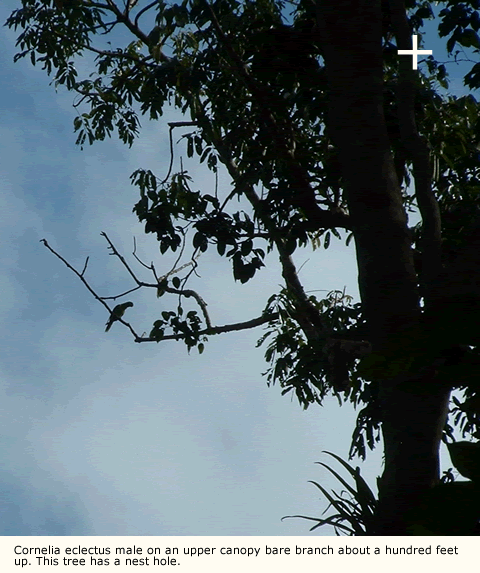 Looking up through a break in the foliage, we saw a pair of Sumba hornbills flying past. Our single file line moved slowly through the narrow archway provided by the thick growth of bushes and trees, one foot after the other, huffing and puffing along. Finally, our guide stopped. We gathered in a small group and looked up into the opening in the canopy to which the guide pointed. About a hundred feet up, we could see a large limb with a hole in it and from that hole, an eclectus female peered out. Seeing us, she called out and a male answered. The stream bed was completely dry and This nest site tree was huge, with sprawling roots extending outward in all directions and a smooth trunk, thick at the base. 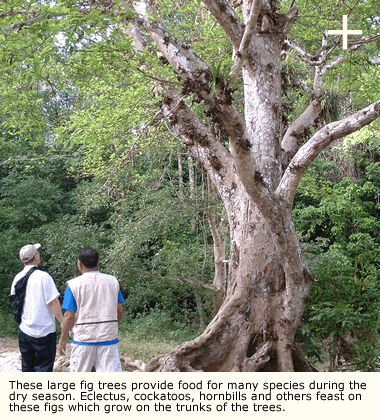 This tree was essentially without limbs until it reached the upper forest canopy. At that point, curving limbs extended out in all directions, covered with shorter small branches with leaves. On one side of the tree were sturdy grey bare branches. The male eclectus flew to these bare branches from which he tried to look down and see us. Suddenly, a pair of Citron crested cockatoos flew into the tree and the eclectus flew out of the tree. The cockatoos spent quite awhile on the bare branches, climbing about and then preening each other. The eclectus pair returned and the cockatoos called out to them and gave chase. All flew off to the right. In the distance we could hear another pair of eclectus parrots calling. One eclectus pair returned to the tree. We watched these birds for some time. Clearly there was competition between the cockatoos and the eclectus parrots for this one nest site. Next we were taken to several of the sites where palm nest logs had been hung up high in these trees. Some were placed on branches, others were placed on small installed shelves. All were held in place by a chain in the back. A very hard type of palm is used. 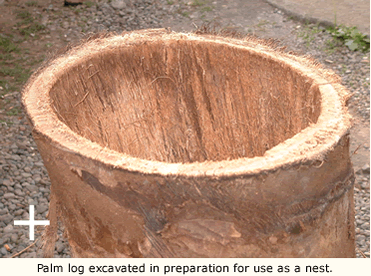 The palm log is cut in half lengthwise and the interior removed. The log halves are then re-attached and tops and bottoms installed. Twenty of these palm logs have been placed in the forest. This is a trial run to learn what works and what doesn’t work. During the rest of our time on Sumba, we visited other forest sites and spent some hours in the office of the Director going over the details of the project and prioritizing the work. Part of the project will be installing twenty nest logs per year for the next five years. The other parts of the project involve a re-forestation program and an educational anti-fire program. In order for this conservation project to work, we will need funding from conservation minded individuals. We have made it easy for people to contribute through paypal and by sending a check. The 501(c)(3) non-profit organization, ABC, Advocates for Bird Conservation, has agreed to handle the funding so that donors can receive an IRS tax deduction. For further information on the details of the project or to participate in supporting it, see www.abcbirdconservation.org and www.eclectusgroup.org.